After my last post, I received many messages urging me to go and see my retina specialist (rs). It is advice that I would have given anyone else in my position, but I did not listen to my own advice. It was only after others encouraged me to call, that I made an appointment. My rs could not find any reason for my symptoms, which included a significant decrease in vision – down to 20/200 in my left eye. He did retina scans and an angiogram but did not see any bleeds or growth of abnormal blood vessels. In order to rule out an optic nerve problem, he referred me to a neuro-ophthalmologist. My appointment with the new specialist was long, even longer than the four hour appointment that I had been warned about when my appointment was scheduled. She ran many tests and found no optic nerve damage. She sent me back to my rs. I did learn one new term. She mentioned that I might have a “Fuchs Spot.” After my appointment, I immediately googled fuchs spot. It seems to me that it is not much different from the damage done by scarring from my bleeds, except that there is currently no treatment. Back to my rs, who did another scan and angiogram and again found no activity that would have caused the decrease in vision. It is probably just degeneration as a result on my ongoing myopia. Just in case, under the guise of “can’t hurt might help,” he gave me a shot of avastin in my left eye. He hopes it helps. There is not much more he can do right now. He does not believe that the degeneration will keep progressing, but thinks it will level off about where I am now. That is good, because I am still able to drive and use the computer without much trouble. So, after all my worry, things are okay. I am at peace with whatever happens with my vision. A lot of people are praying for me. 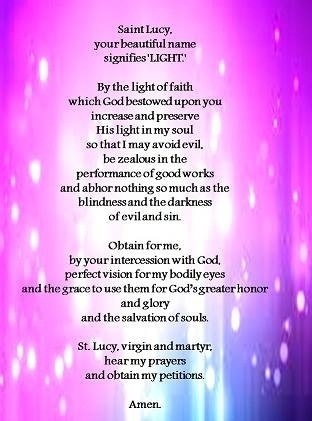 I pray the beautiful St. Lucy prayer every day and it gives me joy to remember that an ability to see with eyes of love and compassion is more important than having perfect vision with my physical eyes.